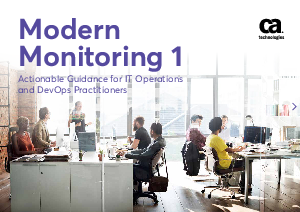 Welcome to the very first edition of Modern Monitoring, a collection of articles and insights designed to help IT operations and DevOps professionals deliver more resilient, supportable and high-performance IT services. It’s perhaps a sign of the times that monitoring as a discipline is receiving much more attention within the biz tech community. And deservedly so. The new distributed application architectures being built, together with the dizzying pace of software delivery, demand new approaches in what’s traditionally been perceived as a “keeping the lights on” IT practice. Of course, there’s no better way to consider monitoring than to draw parallels with other practices in related fields. It’s why we’ve included a couple of pieces with a distinct aeronautical flavor that discuss importance of instrumentation and contextual awareness.